» Home » Past Events » ¡Feria Latina! 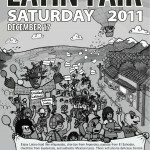 We are proud to announce the 2nd Latin Fair from 4 to 10 pm on December 17th 2011, at St. Helens’ Church, 3871 Pandora St, Burnaby (Hastings & Ingleton). Enjoy Latino food such as pupusas from El Salvador, chuchitos from Guatemala, and authentic Mexican tacos. There will also be delicious Central American coffee, teas, and hot chocolate. You will also find clothes, textiles, and more from Oaxaca, Chiapas and Guatemala – perfect Christmas gifts for all the family! There will be music, (La Trova Nuestra) dance, and cultural activities with local artists for young and old alike. Join us in celebrating the diverse Latino community here in Vancouver! If you want to bring products or food to sell, get involved in the process by contacting: latuc.bc@gmail.com. Brought to you by C4MWJ, Agriculture Workers Alliance, Scalabrinians community; LATUC-BC; CIPOV, Saint Helens’ Church, La Mano & Ecos de mi Pueblo 102.7 FM Radio Show.